A politically exposed person (PEP) is an individual who is or has been entrusted with a prominent public function. Many PEPs hold positions of influence and as a result carry a greater risk, if their influence is abused for the purpose of money laundering, corruption or bribery. In addition to that, any close business associates or family member of these people may also be deemed as being a risk and therefore could also be added to the PEP list. 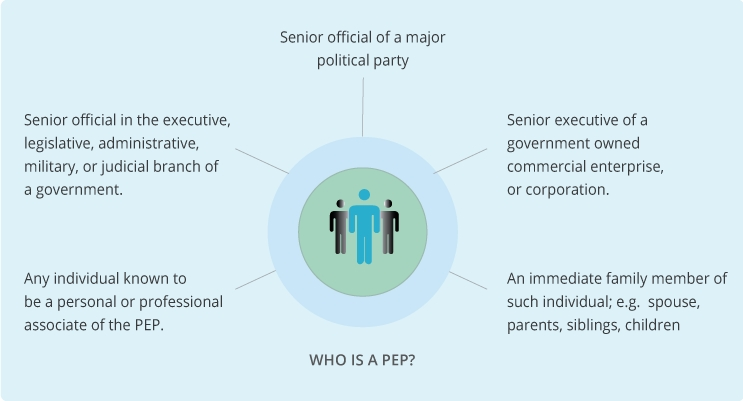 As part of MLD4, the definition of PEPs will be extended to include domestic PEPs i.e. Irish residents in prominent public functions, and obliged entities will be required to review their customer registers to ascertain if they need to apply Enhanced Due Diligence to any existing customers as PEPs under the new definition, as well as applying these measures to new customers at on-boarding. AML4 is due to be transposed into Irish Law by the end of the 2017. The Department of Justice have drafted and published a detailed general scheme of legislation and indications are that the heads of legislation may be published over coming months. As a result the aim is now to publish the Criminal Justice (Money Laundering and Terrorist Financing)(Amendment) Bill by September 2017. Enactment of the Bill would then be subject to Oireachtas timeframes. 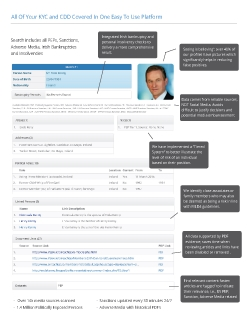 Why Vision-net for your PEP Searches? The Vision-net PEP Search platform is the culmination of several years of research into this area. While some providers like to promote the idea all AML systems are the same. The truth is they vary greatly in depth, timeliness and coverage of data sources. The Vision-net PEP platform provides users with access to over 1.4m PEP's, 4 million profiles of high risk individuals along with 20m supporting documents across 131 jurisdictions. The data grows daily from over 14,000 media sources and is continually monitored. We believe this is the widest global coverage available. While global reach is important and included in Vision-net's PEP platform, the vast majority of Irish entities are now seeking to screen and identify PEP's in their Irish customer base, as a result of MLD4. No one else comes close to our coverage of the Irish market in terms of depth and completeness of our data. For domestic Irish customers Vision-net enriches our PEP data with local insight and additional datasets to offer more comprehensive PEP, risk and background checks than others, on both Irish companies and individuals. What Makes The Vision-net PEP Database Unique? Unlike others Vision-net publishes its coverage and sources of our globe data - to ensure our clients know they are receiving the most comprehensive solution on the market. 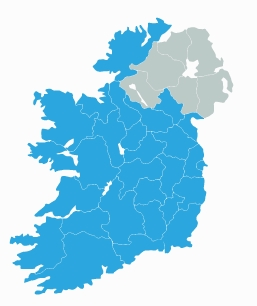 In addition to this Vision-net is the only PEP Screening Service in Ireland that enriches our PEP data with local insight and updates to ensure our clients are always receiving the most relevant and up-to-date result. Vision-net also extends our Irish PEP screening service to include other services such as Sanction Checks and uniquely bankruptcies, personal insolvencies, disqualified persons, revenue defaults - to offer the widest most in-depth AML checks available in Ireland. To View A Copy Of Our Full PEP Brochure - Simply Click Here!